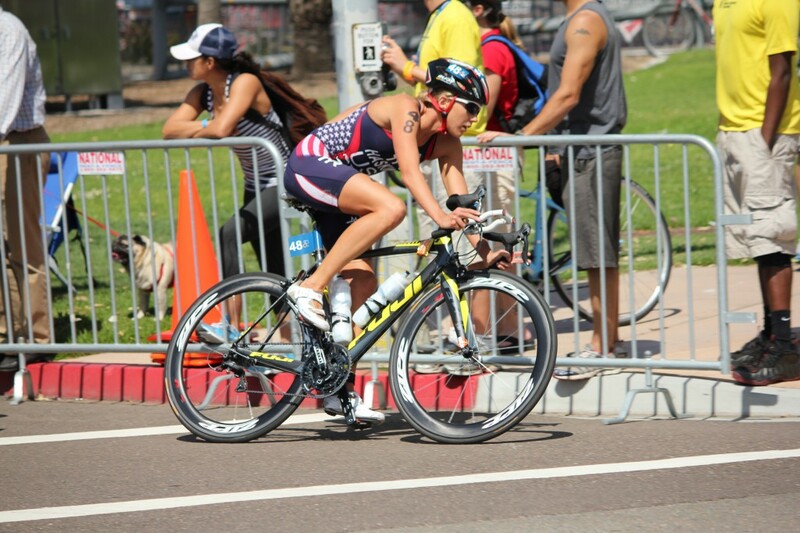 This past Friday, I competed in the second Olympic Trials race in San Diego, CA. I have been mentally preparing for this race since last August and physically preparing for this race since last winter. Preparing and training for one single day is truly the definition of the Olympic dream, sometimes those dreams happen and sometimes you fall short. Unfortunately, I fell short of my goal. 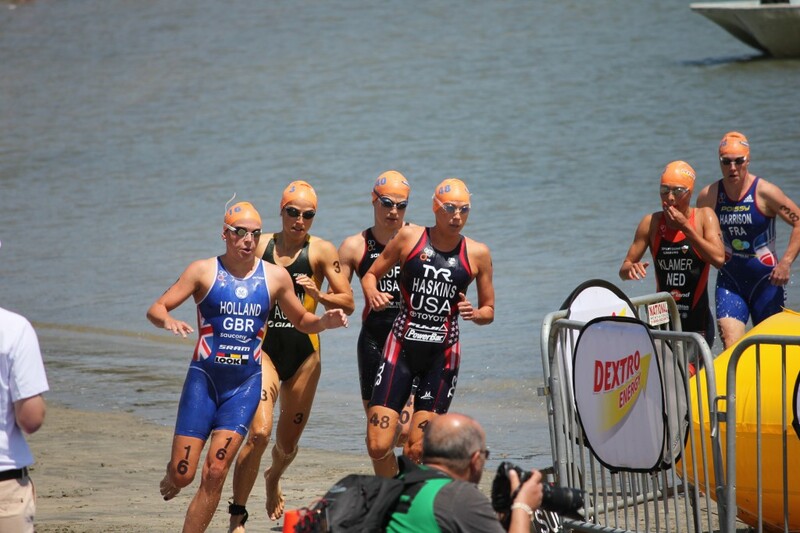 I qualified as the Olympic alternate, with my eighth place finish at the World Triathlon Series race. I needed a top 9 finish to qualify for the Olympics; but also be the top American (minus someone who has already qualified). Laura finished in third position and I could not be more proud of her and all she has accomplished, but personally I am hurting in falling short of my goal. I knew after my race in London last year, the race in May would be very challenging and I was prepared to give it all I had. The weather was absolutely gorgeous for race day. When we are racing, we are not too focused on the weather (at least if it’s not raining), but I was glad the weather was so nice for all of my friends and family who made the trip in cheering me on. I was very anxious to get going race day, as the start was a 2:06PM and it was tough waking up early in the morning and waiting for the start. The Olympic Trials race is much more than a race. It is filled with emotion, heart and determination and I focused on staying as calm as possible before race start. On the swim course, I lined up to the left as I did not worry too much about swim position since I had a lower starting number (with this race being my first WTS of the year). I have learned lately, in the swim I much prefer the approach to going out at a steady pace. I started the swim off at a moderate pace. 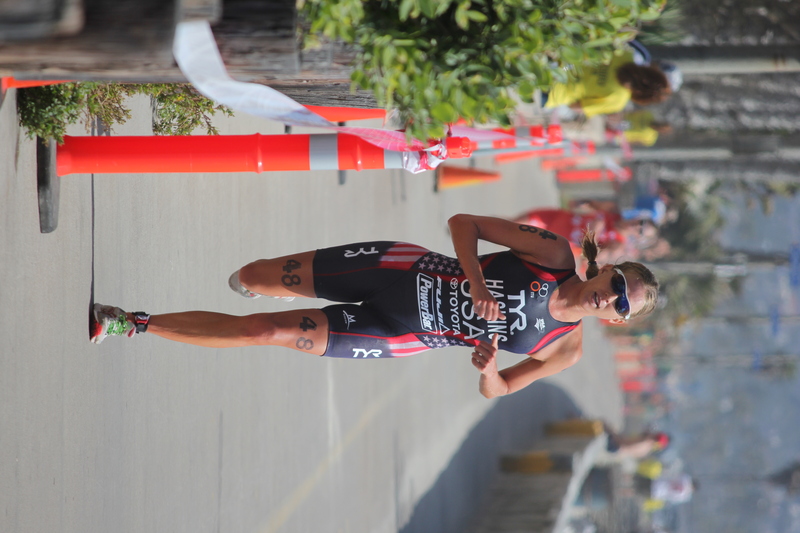 I wanted to move to the front without building any lactate in my system. I did notice the water felt pretty cold, and it was a little difficult to get my arm muscles feeling normal. The buoys were wide and long. It was easy to get bunched in the buoys if you were not leading. As I approached the end of the first lap, I was in third position. 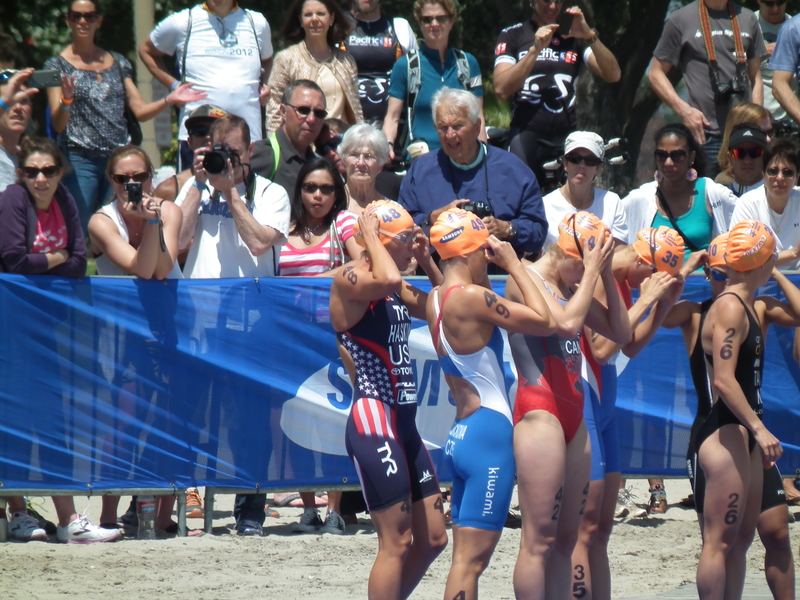 At the run out of the water, the women were really attacking the run out. I lost a couple spots and my heart rate settled back down once I returned into the water. Once I hit the buoys again, I made a move to move up to second position. My arms were finally starting to warm up at bit. I wanted to be ready for a HARD transition run into the sand (and if was was anything like the short run out after the first lap, it was going to be hard). I exited in 2nd or 3rd position and made the charge up the beach. The run up the beach was hard, but I felt good and in control. My first transition was so/so and I mounted the bike in 7th-8th position. The first part of the course is tight and I just focused on putting on my shoes and did not move up in position. I simply sat in during the first 2k of the bike and waited to really start pushing. I think Helen Jenkins was really pushing the pace the first 1-2k of the bike. b I knew in my head I wanted to make the bike course challenging and see if I could break up the group more and see if anyone would go with me on an attack. Once I hit the very short climb on the first lap, I went for it. I hit the hill HARD and once I crested the hill and looked back, I did not see anyone around me. Okay, I thought, I will try again later. The next few laps we continued to gain time on the chase group. We had a perfect size group and normally I would not be worried about attacking a good size group; however, my main competition was in that group and I had to use my strength. Half way through the bike, I used the opportunity to attack again, as I was thinking this is the perfect time to attack. Again I did not have a partner with me. After this I decided I needed to just wait until the last lap. For a short second I thought, should I be attacking? And I thought, YES. I have trained all winter/spring specifically for this. I have trained to be able to attack the bike as hard as I could, while trying to hang onto Nate’s wheel! So, I knew my body could handle this. Heading into the last lap, I made a mistake. I either attacked too many times before and needed to save one big attack up the last climb to get my lead into transition I waited until the flat section in the road before the last turn to pick up the pace into T2. Also, I did not have a very aggressive attack. It was more or less to get ahead leading into transition. Here is my power file and a report done by Training Peaks on my training leading up to this race. I exited the bike second and I felt I had a solid position. I was thinking rack bike, helmet in box and quickly get my into my shoes. My hands were shaking so badly….I struggled getting my shoes on. Regardless, this was my most CRITICAL mistake of the race. I lost EIGHT seconds in transition. I don’t know if it’s because I pushed the bike so hard with the attacks and the attack coming in I had so much lactate that my hands were shaking or ?? Or my shoes were too tight for a fast transition?? Regardless, a strength of mine off the bike is to make a move FAST and start the run fast. Within the first mile, I caught up to the leaders because I know that contact is so important. After the first 2k, I knew I could not hold onto the pace of Erin and Helen. Nate predicts my first mile was around 5:15-5:20, which is way, way, too fast. In the moment of racing, I go as hard as I can to get in the game and that meant getting up to the leaders no matter what. I saw Laura just in front of me, but just struggled to close that gap over the course of the next 6k. It was tough, because for 65% of the run, I felt like we were running almost the same pace, I just lost that contact from transition. Midway on the second lap, Jess Harrison and Holland came up to me. I thought, okay, just stick with them and maybe they will help me bridge up. I was able to hang for awhile, but after I passed through transition the last time headed out on the last lap, I was starting to feel some major muscle fatigue. Once I got to the last 1.5k of the race, I lost contact, lost 30 seconds and lost 4 spots. 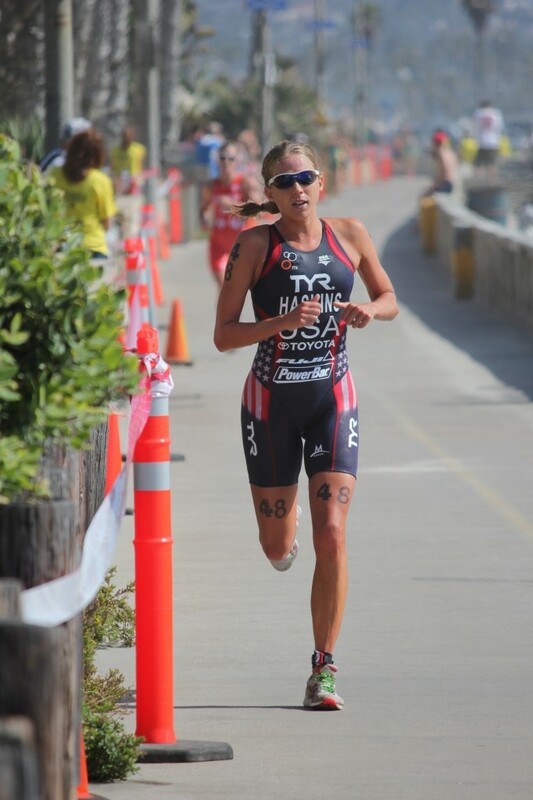 The last 400 meters of the race, I was passed by Flora Duffy and Haug, but my legs were toast. At this point I don’t even think my heart rate was very high, but my muscles just would not move. Not to mention, my heart was sunk. I don’t know if I was feeling the effect of 4 hard attacks on the bike, 8 seconds lost in transition and a 3k anaerobic effort at the start of the run or just simply, I was not there. After the race I think back to all what I could/would/should have done or not done. After eight years of racing, I am still learning and will always be a student. If I am not constantly questioning my racing, that means I have lost my passion to be the best I can be. Normally I would not have attacked so much with a small group; however, this was not a normal situation. I do think that my attacks did help to put time in on the chase pack and I still would not have changed the way I raced. If I would not have tried an attack, and the outcome was the same I would be beating myself up more for not having tried. I do feel much better about this trials race than my first trials race back in August. I used my strengths and fought hard. Before the race I mentioned that I wanted to be proud with the way that I raced and have to say that I am. Reminding myself of this thought is helps me in my disappointment of falling short of my dream. Looking forward I am excited to get back home, back into the routine of training and stepping up to the next starting line. I am so inspired by the phenomenal athletes who will be representing us in London. One of the most memorable experiences of the weekend was watching Manny Huerta cross the finish line and realize his life long dream was accomplished. Whatever path life takes you on, it’s about the journey, continuing to learn, grow and become a better person both in and out of the sport. Thank you to all my sponsors, family and friends who support me each and every day.